The Roccat Vulcan 120 Aimo is a hyper modern and premium gaming keyboard that delivers across the board. Power, style and versatility combine with simply stunning results. Welcome to T3's Roccat Vulcan 120 Aimo review. Over the past month I have been putting Roccat's latest mechanical gaming keyboard through its paces and what follows here is my experiential take on the peripheral. 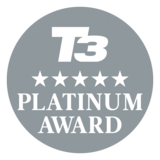 And, as evidenced by the Roccat Vulcan 120 Aimo immediately entering T3's prestigious best gaming keyboard guide in the number two position, the quick take-away from this review is that the Vulcan is a very, very good gaming keyboard that offers a truly premium all-round experience. It combines a beautiful, hyper-modern design with flagship-grade build quality, exquisite "Titan" mechanical switches, plenty of high-level features and a very capable piece of software to control it all, too, in Roccat Swarm. If you are shopping at the premium end of the market it is, without doubt, a must-see before you pull the trigger on your next upgrade, with the Vulcan matched in my mind by only a small handful of competitors. Naturally, you can use the Vulcan 120 Aimo to type "T3.com" into your web browser of choice. For those who want more detail then read on, as this Roccat Vulcan 120 Aimo review is now broken down into a series of categories that deliver more information about its price and availability, design and build quality, as well as performance and features. The Roccat Vulcan 120 Aimo is available now from a variety of retailers. 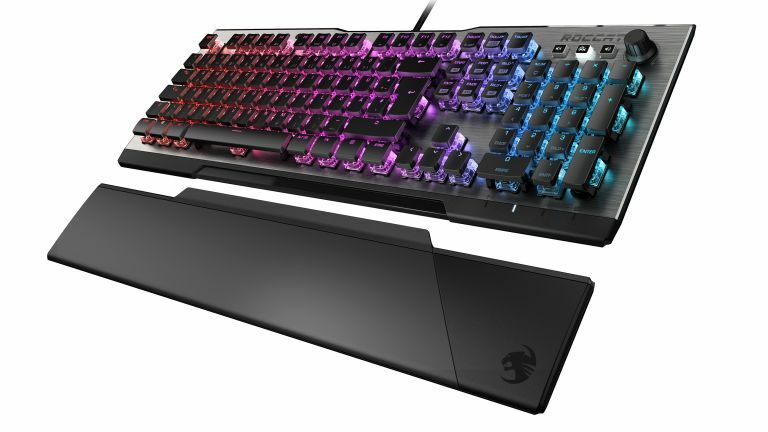 The Roccat Vulcan 120 Aimo is available right now, with the keyboard capable of being picked up from Roccat's own official store, as well as a variety on online retailers such as Amazon, LaptopsDirect and Overclockers. The mechanical gaming keyboard retails for £149.99 new. It is important to note that if you are looking for a specific keyboard layout then if you order through Roccat's official store you can specify which, with over 20 different layouts available. In the box you get the Roccat Vulcan 120 Aimo keyboard itself, along with a detachable wrist wrest and installation guide. An anodised aluminium plate delivers excellent structural rigidity and density, imbuing a premium feel to the Vulcan. Take the Roccat Vulcan 120 Aimo out of its box and, when the shiny cellophane has been removed, the first thing that you notice is the brushed aluminium top plate. Pick it up and the weight of the anodised metal is immediately apparent, with the board communicating a feel of denseness and rigidity. Try flexing the panel and, unsurprisingly, there is no give or warping at all, which is a common complaint I have with boards with plastic plates. This imbues the Vulcan 120 Aimo with presence, too, and grants a confidence under the fingertips - there's no way this thing is going to move or buckle in the heat of combat, causing missed key presses. Keys out of the equation, the keyboard base is actually very understated and uncluttered, with nothing but three small rubberised shortcut buttons and a compact volume knob positioned in the top right hand corner, as well as a line of embedded LED lights in the bottom right. Turn the board round and, aside from its braided power cord, which enters the keyboard bang centre, there are no other ports to be seen. Flip it upside down and you are greeted with two wide kickstand feet, which have grippy rubber feet in both orientation. A breakdown of one of the Vulcan's Titan switches, which are finished off with ultra-light key caps. Where the Vulcan 120 Aimo does gets more expressive is in its keys, which simply put look absolutely stunning. These mechanical keys use Roccat's own Titan switches, which deliver a 1.8mm actuation point with a 3.6mm travel distance, and are both incredibly fast and light under the fingers. In addition, according to Roccat these Titan switches bring electrical contact bouncing (in laymen's terms you don't want it, as it can caused dropped inputs or multiple inputs) to a minimum, while also allowing firmware to recognise input 20 per cent faster than competing switches. And, speaking of the Titan switches, each key on this board is fitted with an individually configurable LED capable of displaying 16.8 million colours which, thanks to the keyboard syncing with Roccat's Aimo tech, which is controllable through its desktop Swarm software, allows you to run a technicolor cavalcade of patterns and lighting configurations. The fact that each key is individually lit, in partnership with the Titan switch's transparent, elevated position of the aluminium base plate, also means that the Vulcan's lighting is very bright, which is something that last year's Roccat Horde Aimo fell down on score-wise. From a lighting point of view, the Vulcan 120 Aimo delivers RGB nirvana. Finally, in terms of design and build quality, the Vulcan also comes will a detachable wrist wrest. This magnetically connects with the keyboard base and can be attached and removed incredibly easily. Unlike the keyboard, though, the wrist wrest is made out of plastic, with two rubberised strips affixed to its base aiding grip. While the wrist wrest looks smart, I would argue that it is not the most comfortable one I have tested on a premium-tier gaming keyboard. Superb mechanical keys and a very impressive lighting engine are major boons for the Vulcan. In the real world the Vulcan's heavy, sturdy base and Titan switches translated for me into absolutely lighting fast and accurate gaming inputs and typing. As you would expect from someone who writes for a living, I can type bloody fast, and at no point did I find the board wanting for speed or stability, even during the most intense coffee-fuelled copy production. In terms of gaming, when playing fast, chaotic titles like Battlefield V or DOOM, I equally never found myself missing keys, pressing keys and getting no response, or getting multiple inputs from seemingly one press, with the linearity and speed of the Vulcan 120 Aimo's keys suiting the frenetic gameplay in these titles perfectly. Roccat's Swarm software allows you to customise every element of the Vulcan, from lighting to key assignments and onto more niche options like typing sound and repeat rate. I was equally impressed with the Vulcan's Swarm desktop software (this works with all of Roccat's Aimo range), which as you can see from the image above, automatically detects any connected Roccat product, auto-configures it, and then allows you to customise it to you heart's content. Everything from the aforementioned key lighting and patterns (wave, snake, heartbeat, ripple, fade and, naturally, Aimo patterns available, the latter automatically adjusting you lighting according to your usage behaviour), through to key and macro assignments (F1, F2, F3 and F4 can be assigned to macros), and onto more niche options like typing sounds (you can simulate things like a typewriter), Swarm gives you an accessible way to control and tweak the Vulcan. Simply put, the Roccat Vulcan 120 AIMO is one of the absolute best gaming keyboards on the market today. Overall, then, I hope it is easy to see from this Roccat Vulcan 120 Aimo review that this truly is a top-tier, premium gaming keyboard. On test I have been impressed with basically every aspect of the keyboard over a month's usage period and, unless you need something very specific in terms of your switch setup, I honestly don't know who this board wouldn't suit. Its build quality and materials, in partnership with its hyper modern design, mean the Vulcan looks fantastic even in a very formal environment, while its superb all-rounder mechanical Titan switches and super-light key caps make both gaming and typing a no-compromise experience. The detachable wrist rest on the Vulcan 120 Aimo magnetically affixes to the keyboard's base. Yes, like most top-tier keyboards today the Vulcan 120 Aimo is definitely an expensive proposition, and I would be lying by omission if I didn't say there were keyboards on the market that offer a similar experience for the average gamer but for less money (I'm looking at you HyperX Alloy Elite). But if you want the best, and this keyboard along with the Das Keyboard X50 are the best on the market right now, then you have to pay for it. It really is that simple. Partner the Roccat Vulcan 120 Aimo with one of the best gaming mice on the market today and you won't be disappointed.